Any good website should first and foremost have the branding and logo present, have an easy navigational structure – especially locations, and specify clear calls to action. This is a big one. It’s fair to say that SEO is among the most successful marketing tools as it captures customers that have already expressed an interest in a particular product or service. This audience is ‘hot’ and wants the solution now. As a business, you want your products and services to have top rankings when the customer searches as chances are it will result in a purchase. This is where local SEO comes in as it helps businesses promote their products and services to local customers at the exact time they’re looking for them. This is done by an array of methods from optimising the keywords on a website to linking other pages. Competition can be intense however and in order to stay on top of the search results, it’s crucial for franchises to implement a local SEO strategy because franchises operate in multiple locations. A solid local SEO strategy will encompass the development of a well planned website structure, have on point keyword targeting, relevant and curated local content, be linked to established websites and all franchise locations Google My Business listings would have been claimed. 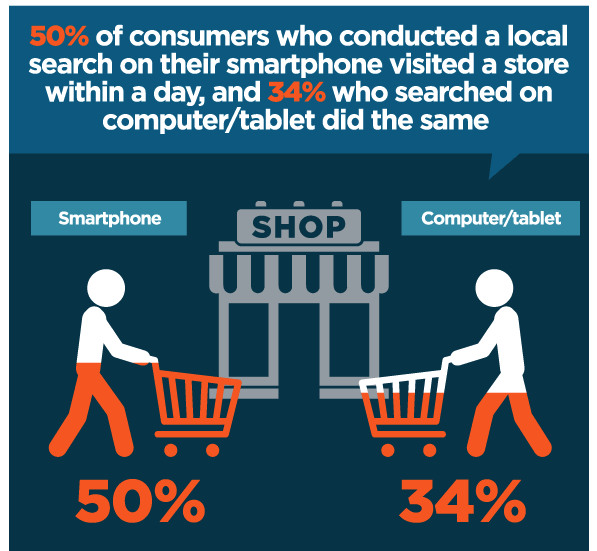 According to GoGlobe half of customers who do a local search visit a store within 24 hours! A good content marketing strategy will have relevant and personalised content with a frequent publishing schedule incorporating great keywords and utilising images and graphics for better user engagement. PPC is any paid traffic directed to a website using platforms such as Google Adwords and Yahoo Search Marketing. These allow businesses to display ads in the sponsored results section of each search engine’s results page by targeting specific keywords. The cost of PPC varies depending on how competitive the selected keywords are. Businesses then set a budget, and only pay when visitors click the actual ads. A recent CleverClicks Report illustrated that PPC traffic converts 50% higher than organic traffic and the majority (66%) of buyer-intent keywords are paid clicks with an average of 200% ROI. These are some powerful stats demonstrating that PPC works fast and can quickly boost website traffic, leads and revenue for your franchise. It is important to note that one of the main reasons why social media is such an effective marketing tool is this: currently there are 2.62 billion users of it, and by 2021 the 3 billion mark will be cracked. Social media marketing is going head to head with the good old TV commercial for the title of the most impactful form of advertising. TV advertising consumption is dwindling fast and according to Zenith it seems highly likely that TV will lose its spot at the top before long. Through social media advertising tools such as ads targeting, companies can reach a huge amount of potential customers. Ad targeting is every marketers dream – the ads can be set up to target particular groups of audiences based on their past behaviour, demographics or interests. Data from Statista shows that Facebook is the top platform with the most active users at 2.23 billion followed by YouTube, WhatsApp, Messenger, WeChat and Instagram and the rest. Data like this speaks for itself – social media is a huge player in the modern day marketing arena and it is crucial for organisations to keep up and understand the latest social media trends. Franchise businesses especially have to make sure that all business information is up-to-date on all social media pages, posts always include great images, all conversations are monitored and responded to and analytics tools are used to measure social media engagement. 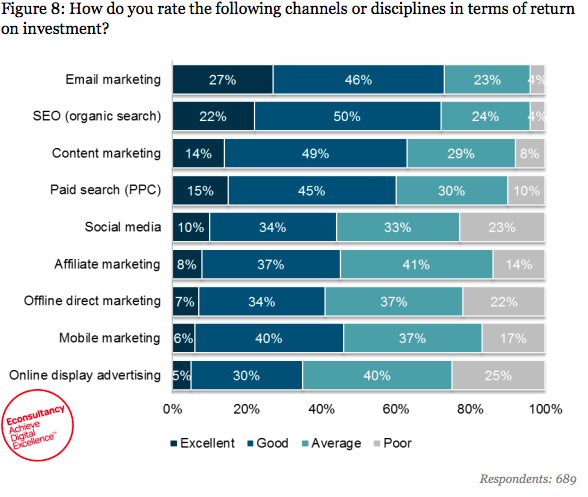 What’s more, a report published by Econsultancy states that almost three quarters of 689 company respondents rated email marketing as good or excellent for ROI. To succeed in email marketing, franchises must have personalised email content, promote consistent branding, always include calls to action and test and optimise the campaigns based on analytics results. What franchises can do is encourage online business reviews as well as make them easily accessible and aim to reply to all reviews as to acknowledge the customers’ concerns. Digital marketing is an evolving journey that has become a businesses requirement in a hyper-competitive business environment. It is essential for multi-location businesses like franchise groups to have solid digital marketing strategies in place as their sheer location presence allows for much greater customer reach and sales revenue.